Practice expressing and managing emotions. New tricks for an old dog to help you rise in the workplace. So you’ve been crushing it at “hard skills” like writing, math or coding, but struggling with waves of disappointment and rejection, inability to pump others up, or stay constantly attuned to feedback in real, meaningful ways that help us rise above? It’s a common problem in today’s workplace. We see it from colleagues who are so stressed and overwhelmed that they can’t compartmentalize projects or move them forward. We see it from friends who are going through a rough time and can’t find it in them to feel happiness for others’ successes. And we see it in ourselves, when we’re tired, losing perspective, and running on creative fumes. Research links the effects of stress on our performance and the value these traditionally classified “soft skills” hold in making or breaking our success. According to the Stress Response Curve, “when stress is perceived as uncontrollable or unmanageable, the person begins to experience a gradual to drastic decrease in performance levels, causing a decline in productivity and enthusiasm to respond to the stress.” Not to mention that without “soft skills” like communication and conflict transformation, teamwork can suffer from poor collaboration and a lack of critical thinking. In order to respond to others and give them what they need to be empowered to succeed, they must feel heard and validated. We all are guilty of listening to a colleague ramble while drifting off to our pending to-do list. Active listening enables you to perceive both the words in an exchange and the feelings behind them, allowing for much greater understanding and empathy. We need to lean in with our ears and our bodies to show others we are truly present to what they are saying. Not only will the conversation be more productive, but our relationships will be built on respect. One way you can do this is by having each person on your team share their name and how they are feeling in that moment, along with a movement. Then have everyone repeat that back.This practice takes active listening to a new level, using imitation and synchronous movement to develop awareness and understanding through our bodies. By associating a thought or emotion with a movement, you are fostering kinesthetic empathy, or the idea that bodily experiences provide a type of knowledge that cannot be conveyed through words alone, allowing others to better connect with you and how you are feeling in that moment. In order to excel, we must be aware of what we need, and either give ourselves that, or seek it out. We have to be honest with where we’re falling short. We can’t listen to ourselves if we don’t give ourselves the space and time to go inward, to sit in silence, and reflect. Before we can express our emotions, we first need to name them. Studies show that a healthy sense of self awareness fosters improved communication skills, reduced stress and anxiety, increased empathy and resilience along with the ability to positively diffuse conflict. One tool you can use to cultivate mindfulness is to pay attention to your breath, noticing where you’re carrying weight or tension in your body and allowing yourself a few seconds at the beginning and end of every meeting to collect yourself. Once we’ve named and been able to identify how we’re feeling, we can move on to expressing those feelings in a healthy way. Research shows that suppressing or avoiding your emotions can make them stronger, causing them to bubble up and explode in an unproductive way. At the beginning or end of a meeting, try allowing each person to practice a healthy expression of emotions by sharing how they’re currently feeling in that moment and how they want to feel by the end of the day. 4. But then managing those emotions. Now that we can identify and express our emotions, we have to manage them so that they don’t rule our lives. Managing stress and emotions allows us to watch those emotions come and go and not feel overpowered by them. Research shows that when left unregulated, chronic stress can result in physical health issues such as: stroke, asthma, stomach ulcers and heart disease. To practice managing your emotions, and supporting your colleagues to do the same, try naming one challenge you’re currently facing on a scale of 1–5 and one thing you need help with in working through that challenge. By containing this expression to a structured time in a meeting or workday, we’re holding one another accountable to working through and managing those stressors. When we acknowledge diverse perspectives and backgrounds, we create an environment for healthy self expression and creativity. We understand that one person’s struggle is another person’s strength, and that our differences make us stronger. Cultivating resilience gives us the confidence to take big risks and support one another toward a common goal. Resilient individuals are proven to be more engaged, have improved communication, and are better team players.To create the space for this discovery, build in a few minutes at the beginning of a meeting for each team member to share what they’re most proud of that day, or one offering they would like to contribute to the group. The structured space for this sharing may illuminate gifts you did not know existed among your team. Strengthening our soft skills and doing the self work is a lifelong journey that we will never complete, and if we don’t commit to the work ourselves, we can never expect our colleagues to do the same. We must continue to evolve and grow in how we make meaningful, authentic connections with ourselves and others. We must prioritize it and champion it, throughout the day and for all levels of our organization, because we know that soft skills are the coping mechanisms that allow us to navigate what work and life throw our way, and ideally thrive while doing it. 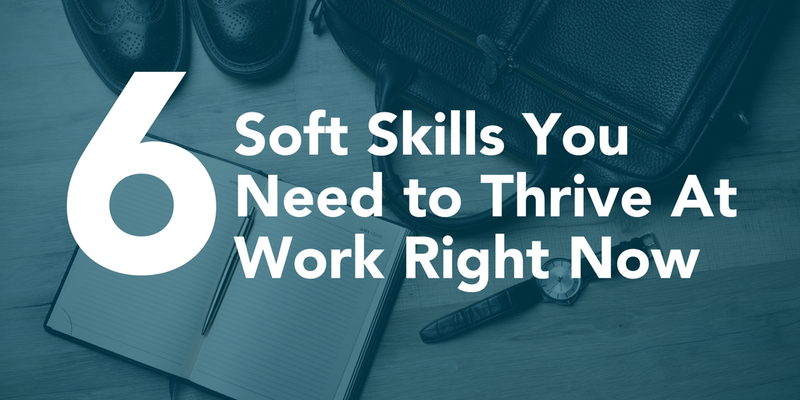 Want to learn more about cultivating “soft skills” and other ways to crush it at your 9–5? Follow Move This World on Twitter for weekly tips & stories.